Think last night's spaghetti dinner from a box or jar and labeled with an Italian sounding word was the best you've ever had? Chances are it doesn't measure up to what Indiana State University student and native Italian Margherita Berti had Sycamores serving up during Italian cooking classes at the Institute for Community Sustainability this semester. In 2015, Berti finished her first college degree and left her home in the northern Italian city of Bergamo, about an hour from Milan. She travel to the U.S. to be closer to her fiancé in Indiana and enrolled in Indiana State's master's degree program in linguistics/teaching English as a second language. She has also sought ways to infuse her language and culture into her newfound home and was quick to seize an opportunity from the Center for Global Engagement to engage the campus community through two of her passions, food and the art of cooking. "I want people to know what real Italian food is like because the restaurants in the United States are not quite Italian," Berti said. 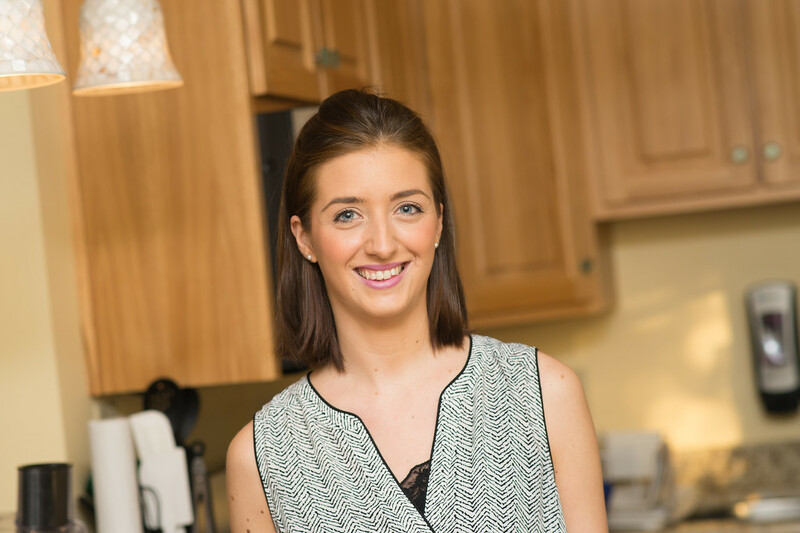 "Since I love cooking so much, it was a good opportunity when I was approached about teaching a cooking class through the Center for Global Engagement, which was looking to create more cultural activities for students." And culture she has brought. In the two cooking classes she's taught, Berti has exposed Sycamores to the beauty of a simple but real Italian way of making pasta with tomato sauce and a chocolate salami - a common Italian dessert. Her second class tried their hands at dishing up pasta with a pesto sauce, which she promised was simple even for the novice cook among us. Berti bounced dish ideas off of her friends and her office mate, who is from Germany, looking for input on Italian dishes they would want to learn to cook that aren't too hard and are doable in a two-hour class. "I want to use that time to help students experience real Italian food and culture at the same time," she said. "I had a few students from my Italian class attend and some knew their way around the kitchen, some didn't. I had a student tell me that the only thing they know how to cook is a grilled cheese sandwich. I was like, ‘OK, you can learn this. It's easy.'" Berti is a favorite guest chef for the international cooking demonstrations that bring international and domestic students around the table to connect through something near and dear to everyone's hearts - great food. "Maggie teaches dishes that are simple, healthy, quick and delicious, which makes them very accessible to the participants who come to the events. Some of the dishes are familiar, like tiramisu and pasta with pesto, but she teaches how to make these things ourselves ‘from scratch,' with fresh healthy ingredients," said Pam Tabor, international student advisor for the Center for Global Engagement. "One outcome is that domestic students, who may find international students difficult to connect with or relate to, realize that they may have more in common than they ever knew, and that their lives can be richer as a result of knowing them. Everyone learns a little more about cooking, too." The class has been a way to draw students into the Italian culture, while giving Berti an opportunity to speak more Italian in a place with few native Italians. "I speak English almost 24/7, except when I'm on the phone with my family back home," Berti said. "This semester, I teach Italian, and in the spring I'll be teaching English as a second language. I tried to teach the students in the cooking class a little bit of the language, but it was hard to keep up with everybody and make sure that everybody was understanding what was going on." Berti has been sharing her culture in the U.S. since she came to Indiana as an exchange student at Bedford-North Lawrence High School during the 2008-09 school year. It's when she met her now fiancé and discovered her passion for learning and teaching languages. "We did a long-distance relationship for many years while I got my first degree in Italy, and then I decided to come back to Indiana to be with him and get my master's degree," she said. "My high school diploma was a scientific diploma, so it was about science. During my school year here in high school in the U.S., I started to appreciate languages more. I started learning foreign languages in Italy at a very young age." Berti learned to speak English at age 6 and at Spanish at age 10, and now she is applying to Ph.D. programs to further her study of languages after she graduates in May. "I studied foreign languages my whole life and I didn't really enjoy my high school in scientific topics, but after my exchange year in the U.S. I liked languages a lot more and decided to get a degree in languages and literature," she said. "After I did that, I was looking to come back to the U.S. to get more education, and I was offered the opportunity to teach by my department at Indiana State and I really enjoy it. If I get accepted into a Ph.D. program, it will be another five years in school." That's not so bad for Berti, who has enjoyed experiencing the American school system. "The professors in Italy often don't know your name or interact much with their students, because there are a lot of students in one class," she said. "Here, there are smaller classes and I'm working with the department and was offered the opportunity to teach, so it's a great step toward my future goals as I grow as a student and as an instructor. The professors are great if you have any questions or doubts." As Lisa Calvin, a professor in the department of languages, literatures and linguistics' teaching methods course for teaching assistants, has witnessed, Berti's consistently does exemplary work in written projects and contributions to class discussions. "She has taught both Spanish and Italian and is a dedicated and organized instructor who reflects upon her teaching practices and their effectiveness to help students succeed, and Maggie also takes her passion for Italian culture outside of the classroom, doing things like offering an Italian cooking demonstration," Calvin said. "For the first time in my 18 years at ISU, I suggested to a graduate student that we give a presentation together at the Indiana Foreign Language Teachers Association fall conference. Maggie enthusiastically agreed. Her professionalism had proven to me that she would be a reliable co-presenter, and I wanted to take the step to mentor her in what I know will be a highly successful career." Berti, who speaks Italian, English and Spanish and has dabbled in French and Latin, aspires to teach Italian at the college level in the U.S.
"In Italy, we start learning foreign languages early and in high school year learn a second language, besides English," she said. "Here, some students do not study a foreign language in high school and they come to college without trying to learn another language, so it's harder for them to understand how to do it. They know English and most people around the world know English, so they don't get much of a chance to learn other languages. I try to help them, though, and tell them that it is good to learn a foreign language because you don't only learn the language, you also learn the culture and have a better understanding of the world." Photo: https://photos.smugmug.com/Other/Media-Services/Media-People/Margherita-Berti/i-PSRvm8P/0/XL/November%2017%2C%202016%20Margherita%20Berti%208724-XL.jpg - Margherita Berti, an Indiana State University student from Italy who is enrolling in language, literature and linguistics/teaching English as a second language master's degree program, teaches an Italian cooking class at the Institute for Community Sustainability though the Center for Global Engagement with assistance from Pam Tabor, the Center for Global Engagement international student advisor. 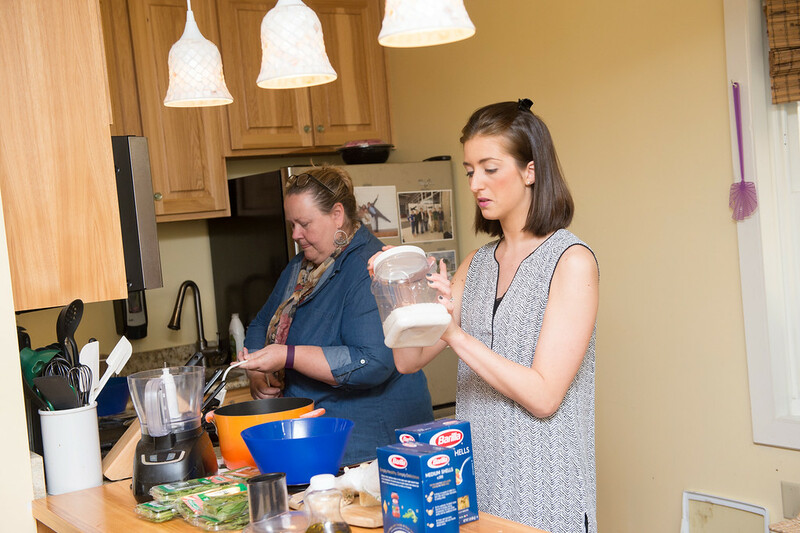 Indiana State University student and native Italian Margherita Berti had Sycamores serving up during Italian cooking classes at the Institute for Community Sustainability.